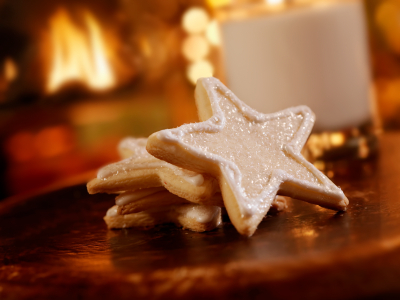 Remember to leave cookies and milk for Santa! Christmas is less than a week away and Hanukkah starts tomorrow… time to start baking (if you haven’t already). These cookies bring me back to when I was a kid, helping mom bake before the whole family came over on Christmas Eve. 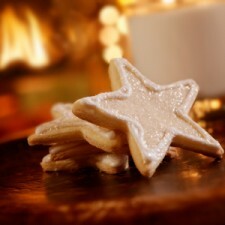 Sugar cookies are a must have for your holiday get together. They are so simple, but everyone loves them! Plus, it gives you and the kids a chance to get creative and decorate with frosting, sprinkles, or just about anything you want. In a large bowl, “cream” together coconut oil and sugar until smooth. Beat in eggs and vanilla. Stir in the flour, baking powder, and salt. Cover, and chill dough for at least one hour. Preheat oven to 400 degrees F. Roll out dough on floured surface 1/4 to 1/2 inch thick. Cut into shapes with any cookie cutter. Place cookies 1 inch apart on ungreased cookie sheets. Add sprinkles, if using. Bake 6 to 8 minutes in preheated oven. Cool completely. Decorate! These are so yummy. I love these cookies. OMG these are the best cookies I have ever made. So easy and fun to make. Thank you SO much!!! Thanks Kristie! So glad you liked them! Coconut oil really is the best for baking!